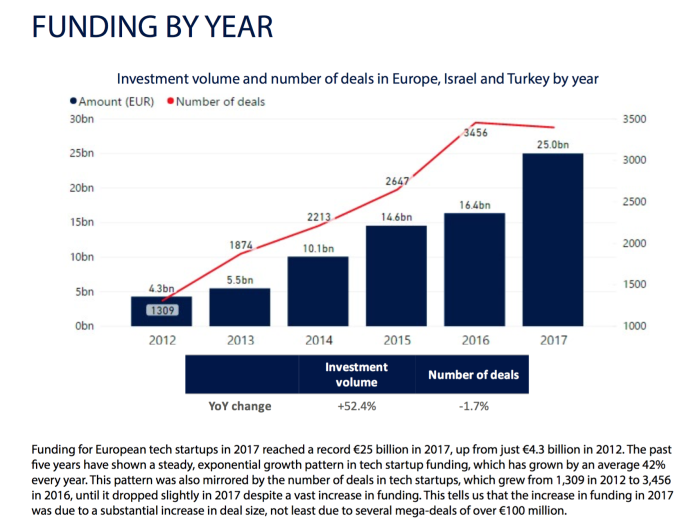 Europe’s tech scene is rapidly maturing, as evidenced by a steady increase in equity funding in tech startups, an amount reaching €25 billion+ in 2017. The region is also now home to 57 ‘unicorns’, according to research by GP Bullhound. Europe’s great diversity – an amalgamation of over 40 countries with their own languages, cultures, and regulations – has created both challenges and advantages for its startup ecosystem(s). On the one hand, language and legal barriers can make it harder for European startups to expand and scale into neighbouring countries. Yet the continent’s diversity also contributes to its creative potential and innovation. Europe is starting to embrace entrepreneurship and its many strengths – a talented workforce (Europe’s tech workforce increased three-fold in 2017, and is home to more programmers than the US), top academic and research institutions, and increasing government support, with a lot of new investment coming from the EU and state-backed investment banks. The digital economy in Europe is growing 7x as quickly as the rest of the economy, and creating 3x as many jobs as any other industry. Today at the Startup OLÉ conference in Salamanca Spain, in collaboration with our partners Axon Partners Group, we are launching an exhaustive report on the current state of European tech. Best of all, it’s completely free of charge – you can download a copy right here. 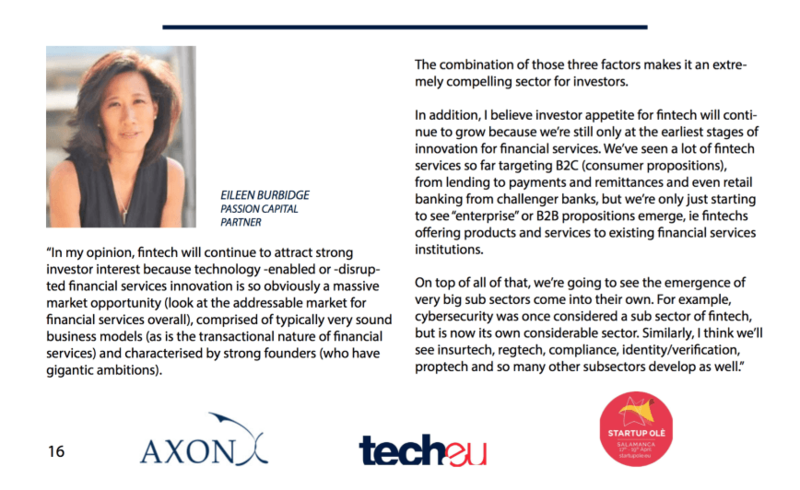 The report dives into funding, M&A and IPO trends in the European tech scene, with historical context, analysis and insightful contributions from the likes of Carlos Moedas (European Commissioner for Research, Science & Innovation), Eileen Burbidge (co-founder of Passion Capital and FinTech Envoy for the UK government), Alberto Onetti (Chairman, Mind The Bridge), Roxanne Varza (Managing Director of Station F), Isidro Laso Ballesteros (Head of Startups and Scale-ups, Startup Europe), Karen Boers (president of the European Startup Network and MD of Startups.be), Nicolas Brusson (co-founder of BlaBlaCar), Francisco Velazquez (partner and president of Axon Partners Group), Stéphanie Hospital (founder and CEO of One Ragtime) and many more! Enjoy (and share) the report and let us know what you think.